Twisting, stumbling, slipping: What happens? And what can I do about it? In 2008, the Federal Institute for Occupational Safety and Health (BAuA) published a detailed paper on their research project “Determination of factors influencing stumbling and twisting”. The project involved analysing stumbling and twisting and highlighting the influencing factors that encouraged these – and where preventive action could be taken. The DGUV also provides a scientific analysis of slip hazards. These research projects indicate the bases of movement that exist and the influences that may eventually lead to SSF accidents. (Fischer, H. et al. : Vermeiden von Unfällen durch Stolpern, Umknicken, Fehltreten. [Avoiding accidents caused by stumbling, twisting and missstepping.] Report F 1641, Dortmund 2008). One step comprises multiple individual movements by different parts of the body. The lower body parts are connected to each other via three pivot points – the ankle, knee and hip joint, as well as with the torso and the upper extremities for stabilising balancing movements. The gait itself can be broken down into two phases: Firstly, the stance phase, during which the foot is on the ground and secondly, the swing phase, during which the leg performs a pendulum-like swinging movement. Every time contact is made with the ground, the ground reaction force acts accordingly on the body. We have the most stable position at the moment when the line of action of this force runs exactly through the centre of the axis of rotation of our joints. As soon as the line of action leaves the centre of rotation, torque is generated that pushes the joint into a certain position – thereby provoking a counter-reaction of the muscles to keep the joint stable. The gait itself becomes an automated and unconscious movement for everyone in the course of their life. The disadvantage of this is that in the event of unforeseen external influences, a fast counter-reaction to compensate for faulty movements is often not possible or does not happen fast enough. Disturbances can therefore quite simply influence the gait system in such a way that we twist, stumble or slip. There are multiple disturbances in a typical working environment: Both the condition of the workplace and inappropriate footwear can influence this. Unevenness, edges, stones, different floors and damping mats, for example, may lead directly to twisting, stumbling and slipping. But factors such as brightness and lighting, your own perception, fatigue, overload, distraction or time pressure also play a decisive role. Preventive measures should therefore involve both the working environment and the choice of an optimal safety shoe. There are two types of twisting: On the one hand, unevenness, edges or objects lying around can cause twisting. If such an obstacle is encountered, the line of action of the ground reaction force may lead past the pivot point of the joint on the inside – and we then twist (see images). However, the shoe construction can also encourage twisting – especially if the sole geometry is inadequate or there is a lack of support in the heel area. At the beginning of the stance phase, when almost the entire body weight is carried by one leg, twisting is very likely. This may result in injuries to the tendon and ligamentous apparatus. The most important stabilising elements are the body’s own muscles, tendons and ligaments. Ideally, these will be strong enough to protect the ankle from serious injuries. However, sufficient strength can only be applied by muscles (active), tendons and ligaments (passive) if they are sufficiently trained and used. Nevertheless, footwear also plays an important supporting role – even if the relevant standard does not contain any specific requirements for protection against twisting. The BAuA report mentions the leg length of footwear as a crucial factor. 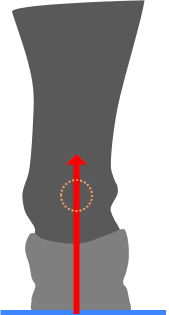 In boots, the leg ends above the ankle joint and may therefore have a stabilising effect on the joint. However, it’s crucial that the boots are used correctly – if the boot is not laced up properly, the effect of the high leg is lost. Additional, attached rigid elements (cuffs) are often used to prevent twisting. The BAuA’s investigations establish however that it is not yet clear whether injuries can be reduced in this way. We therefore recommend supporting the foot through an optimally designed fit, cushioning and flexibility of the safety shoes. In our opinion, these factors are crucial for stabilisation, without overly limiting the scope of movement or the natural movement. Low shoes may therefore also ensure sufficient safety. Of course, influencing factors in the surroundings usually play a decisive role in stumbling, too – elevations, grooves, crevices, floor coverings, cables and many other large and small obstacles, for example. It’s less obvious that footwear can also make a big difference: To ensure a safe, controlled gait, optimum fit is essential. The design of the sole and last also contribute to minimising the risk of stumbling. In addition, a sole that offers maximum cushioning and flexibility supports the natural movement pattern, which in turn supports a safe gait. Adding a ‘toe spring’ to the last at the end also reduces the risk of stumbling. Here, the distance between the toe cap and the ground is crucial. With a higher toe spring, the tip points upwards and thus minimises the risk of getting caught on anything. Another influencing factor is the friction between shoe and ground – if this is too high, it can also cause stumbling. Slipping occurs when balance cannot be maintained while walking because the foot cannot grip the ground. 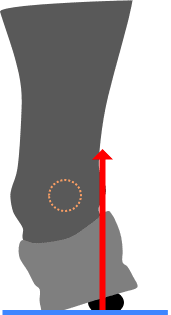 First, a short explanation of the biomechanics of walking: The first contact with the ground when walking is made by the heel, at which point the body’s centre of gravity is still significantly behind the heel (see diagram). In normal cases, there is then a rolling movement through the heel, metatarsus and forefoot. This ends with the pressing down of the foot, followed by the swing phase, during which the other leg is in the stance phase. Slipping usually starts at the exact point at which the body’s centre of gravity is not vertical above the ground contact point, for example at the beginning of the stance phase. To reduce the risk of slipping, there are already various rules and guidelines (legal duty to maintain safety, the German workplace ordinance, technical regulations and so on), which require floors and shoes to have a minimum slip resistance. Naturally, on the basis of this, there are also corresponding test procedures for floors, and indeed for safety shoes. Safety shoe tests assign the designations SRA, SRB and SRC to the shoe. The main causes of slipping are slippery floors and smooth soles, and also additional lubricants on the floor. But of course there are also further influencing factors that make slipping more likely: Similarly to stumbling and twisting, the individual’s perception of the environment also plays a major role, as does the visibility or identification of special risk areas. For safety shoes, preventing slipping involves the ‘anti-slip properties of the sole’. Above all, the anti-slip properties are supposed to ensure safe walking. For better measurability and comparability, the anti-slip properties are defined by the so-called coefficient of friction: this comes from the friction between the floor and the shoe. For their part, the anti-slip properties can be influenced by many different factors, for example by materials with different characteristics, surface structures, the speed of movement and other environmental parameters. Various test methods exist for measuring the anti-slip properties and determining the coefficient of friction of the different materials. These focus on the one hand on the slip properties of the floor but also on the properties of the shoe sole. The tests for measuring the slip properties of various floors are used to assign floors to specific categories. In these tests, the floor is the medium to be tested, while shoe characteristics play no role (or are standardised for the test). The slip properties of safety shoes are determined with the help of a shoe testing machine. 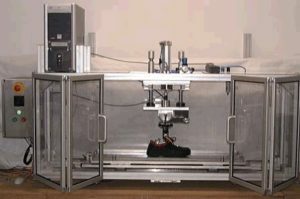 This calculates the coefficient of friction of the shoes, by sliding the test shoe at a defined speed and contact pressure over a reference floor. The shoes are tested on two different floor coverings with an intermediate medium and with two different angles of attack for the shoe (see table). The standard prescribes the minimum requirements for this test procedure that must be achieved in order to receive the relevant designation. Tests that deal with slip prevention for both floors and shoes are therefore sufficient. But what conclusions can be drawn from these results for real-life conditions? Standard test procedures are all about comparability. For this kind of test, a standardised test set-up is developed, which probably never occurs in a real working environment in that way. Accordingly, the informative value of the results is initially limited to these standard specifications only. Nevertheless, the results can be used for an initial assessment of suitability for the various areas of application. However, if working environments exist in which special, slippery floor coverings and/or lubricants are present, an individual field test with the desired shoe should confirm suitability. As we’ve already learnt, accidents are frequently caused by twisting, stumbling and slipping – and often lead to serious injuries and thus absences from work. Accordingly, legislators and professional associations try to set appropriate guidelines for the working environment and also for the personal protective equipment used there. In addition to meeting these requirements, our aim is to best support you, the safety shoe wearer, at work and to take the stress out of your job – or at least to make sure that your PPE doesn’t cause you any extra stress. 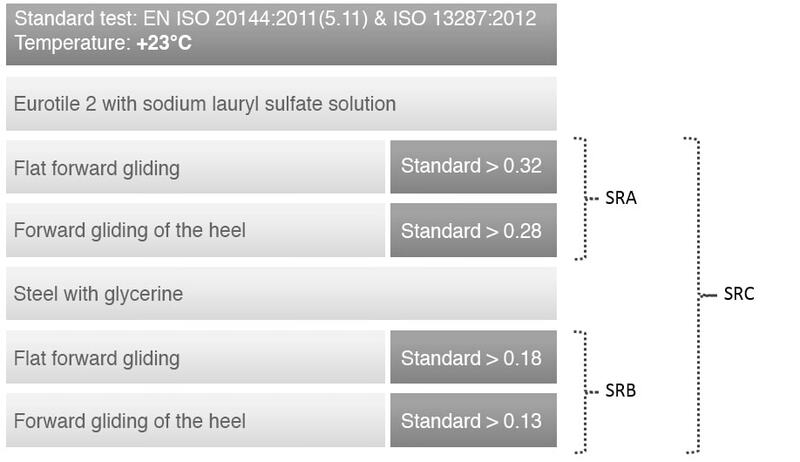 When it comes to the sole of the shoe, the EU standards include specifications according to which a shoe sole must be designed to ensure optimum anti-slip properties. Depending on the material used, the outsole will have slightly different properties. On the other hand, there are no special requirements for protection against stumbling or twisting. Our goal is always to develop the shoe with an optimum fit, so that it provides its wearer with the best possible support during natural movement patterns – without losing sight of the protective characteristics of the safety shoe. More than anything, a good fit requires stability in the heel area, to keep the foot in position. But cushioning and the flexibility of the shoe are also essential, because they enable the optimum distribution of pressure and support the body’s natural rolling motion. And especially during this rolling motion, any penetration-resistant midsoles also play an important role. Here, the advantage of the textile penetration-resistant midsole is that the flexibility of the shoe is less affected, while a midsole made of steel will make the shoe noticeably stiffer. However, in certain sectors – for example the construction industry – steel soles should be preferred because they offer better protection against nails and the like. Influencing factors for SSF accidents can therefore be found both in the working environment and sometimes in the shoe design. Professional associations’ guidelines are aimed at minimising the risk of accidents in the workplace. As a manufacturer, we develop shoes with the same aim. They should provide their wearer with the best possible support, without overly influencing their natural movement pattern. The leg design in the ankle area may also help – the main focus should however be on the ideal fit (especially in the heel area), optimum cushioning and best possible flexibility. You’re sure to find what you’re looking for in our wide range of shoes. Shoes help in protecting our feet from injuries. Choosing the best safety shoes is very beneficial and important for workers working in a dangerous environment. “Colourful PPE” (part 3 of 3): How useful is PPE in company colours – and is that even possible?